Ask any Australian adult what their fondest memory of childhood television is and nine times out of ten the answer will be Play School. That pastel coloured dreamscape where kids are taught manners or the name of different shapes – often through the crafty teaching device of music – completely devoid of advertisements thanks to it’s loving home, the ABC. 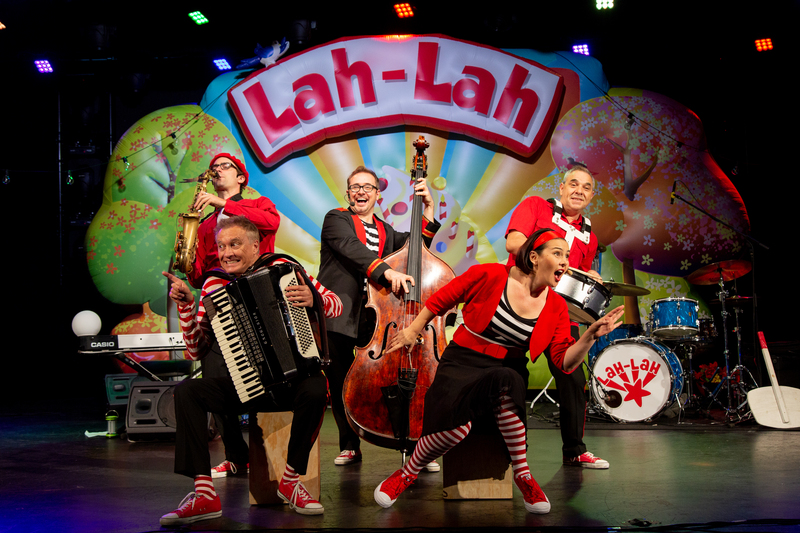 Husband and wife duo Tina and Mark Harris, otherwise known as Lah Lah and Buzz the Band Leader of beloved children’s series Lah Lah’s Adventures, want to bring more of the wholesome, unmonetised, music-forward childrens programming to Aussie boxsets. “Music’s brain food. When you expose a young child to music, it helps with physical development, their emotional development, it just makes them smarter little humans. Giving music to young children, exposing it to them, encouraging them to play along with music on the radio, or television, or going out and listening to live music, it’s just so, so good for them,” Tina tells TMN. And that’s exactly what the pair is doing with their new venture The Stripy Sock Club, a spiritual second series to Lah Lah’s Adventures which debuted on 7TWO in 2014 and has been syndicated on BBCKids and Canada’s Knowledge Network. They’ve got the script, the actors, the brand new, state-of-the-art studios courtesy of the Royal Melbourne Institute of Technology (RMIT) but in a story that’s oh-too-familiar to people in the music and media industry – they lack the funding. “In preschool television, quite rightly so, it’s internationally regarded that you should not put advertising or product placement into preschool children’s content. Absolutely the right thing to do, but that removes the commercial imperative for a broadcaster to make that content at all,” explains Mark. Which is why they’ve launched an Indiegogo campaign to raise the $300,000 needed to fill the production budget gap and get the series commissioned on the ABC, the current home of Lah Lah’s Adventures reruns. In before an angry chorus of “Why isn’t the ABC funding it fully?”, as Mark explains – they also just don’t have the budget. “It puts them into a difficult position, where they want quality Australian television, but they’re not able to commission it,” continues Tina. As Mark expresses, while it’s difficult in the best of times to get content made for preschoolers (0-5 years) off the ground, with ABC budget cuts and an unregulated commercial system it’s almost impossible. “In the children’s category [5-14 years], there’s a floor as to the price they have to pay per half hour for this content. And so there’s a minimum quality, which is actually really high,” says Mark. The crowdfunding campaign, however, proves that there’s public support for quality preschool programming. Launched just over 10 days ago, the initiative has already garnered over $75,000 in donations from parents of tots hungry for more Lah Lah. “We’re over the moon about that,” says Mark. “We were looking at the statistics today, we’ve had over 7,000 people actually visit the page, but we’ve had about 300 people who have actually pledged to the page,” explains Tina. While it is a great start the pair assure that there’s still a long way to go and when it comes to using RMIT’s 3D animation studios, time is of the essence. Tight scheduling and the need to use the studios while cit’s devoid of students means that January 2019 is the only opportunity for shooting. “The thing about the facilities at RMIT and why we’ve put this clock on it is because this particular technology is really new now,” says Tina. “So the fact that we can take a human, and put them in a 3D animated environment in real time, that’s never been done in the country before. It’s cutting-edge technology. As the preschoolers programming market is flooded with UK and American content Tina expresses how important it is for Aussie kids to see local content in those formative years. Parents and bubs across the nation needn’t worry though, even if (God forbid) Mark and Tina don’t reach their crowdfunding goal the show will still go on. “I think, maybe for families, looking at a crowdfunding platform, they’re looking at it going, is this actually going to happen or is not going to happen? This is 100% going to happen. We’re going to make this thing.” laughs Mark. “The only question is how much content can we make,” Tina says with a smile. Click here to find out more information about The Stripy Sock Club and how you can throw your support behind it.